. . .Then at an opportune moment he drew Jean away into the cedars out of sight. "Son, I shore hate to make your home-comin' unhappy," he said, with evidence of agitation, "but so help me God I have to do it!" "Dad, you called me Prodigal, an' I reckon you were right. I've shirked my duty to you. I'm ready now to make up for it," replied Jean, feelingly. "Wal, wal, shore thats fine-spoken, my boy.... Let's set down heah an' have a long talk. First off, what did Jim Blaisdell tell you?" Briefly Jean outlined the neighbor rancher's conversation. Then Jean recounted his experience with Colter and concluded with Blaisdell's reception of the sheepman's threat. If Jean expected to see his father rise up like a lion in his wrath he made a huge mistake. This news of Colter and his talk never struck even a spark from Gaston Isbel. 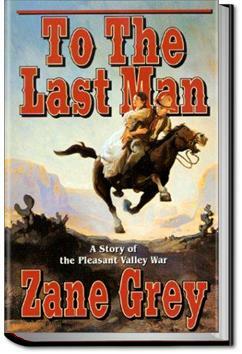 Zane Grey takes real life feud and turns it into a romance novel. Yuck. Two stars for the beautiful descriptions of the Arizona landscape. As the name implies, and in spite of the characters seeming to have more sense, the killing goes on to the last man. It is Zane Grey's interpretation of a real event. This book is a lot like a western Romeo and Juliet but with the opposite ending. Obviously with a title like "To The Last Man" we all know that it is going to be a fight til only one man lives. Also to the last man doesn't include women. This would for me be a 3.5 book (ah could we but give half stars). I don't rate it a 4 above as I didn't enjoy/like it as much as I have most to all of the books I rate 4 point... After all beyond that all that's left is a full 5.